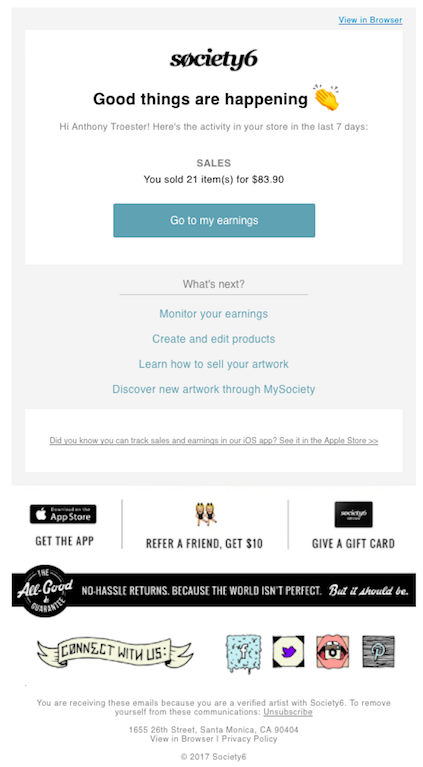 Society6 exists to provide the world’s artists with a platform to express themselves creatively and share their artwork with a global audience. When we first began selling art in 2009, we produced just one product – art prints. Today, we provide the ability to sell artwork on 40+ premium products, giving artists more control over their product offering and more selection to our customers. As you can imagine, hosting 4+ million designs on 40+ products comes with some challenges, one of which is discoverability. We want to help artists get discovered and customers find the perfect product to buy. To do this we have to get organized. You may have recently noticed some updates to the department filters on artist shops and listing pages across the site. Instead of 5 high level departments (art, home, tech, men, and women), there are now 9 (wall art, home decor, pillows & bedding, bath, tabletop, stickers & stationery, tech, apparel, bags). These departments are based on our research on customer shopping behavior and sets us up for future product releases. Soon, these changes will also be reflected in the main site navigation. We are committed to making this transition as smooth as possible, and when all is said and done, customers will have a much easier time discovering all of the amazing artwork you have created on S6! Thanks, and keep up the great work! We are extremely excited to officially announce the launch of a brand new version of artist shops! The new design will not only help customers find (and buy) your products, but also help establish your brand as an S6 artist. We’ve spent the last few weeks testing the performance of the new version and could not be more thrilled with the results. We hope you are too! Read more about them here. Duffle Bags are now available for sale! Get your designs ready and take a sneak peak of some of the amazing products that are already available for purchase. This morning we kicked off a weekly sales digest email to selling artists! If you’ve made any sales in the last 7 days, you will be a receiving an email (every Monday) letting you know how much you’ve earned. Along with the S6 iOS app which has realtime notifications, we hope this helps you stay up to date with your sales! Stickers are now available for sale! For more info, check out our blog. Stickers are not automatically added to your shop, so you’ll need to activate them yourself! iPhone 8 and iPhoneX cases are now available for pre-order! Read more about them here! Backpacks are now available for sale! As usual, we encourage your to add or edit artwork for this product from within the Artist Studio. Read more about them in our blog, or see them live in action here. One of our goals is to provide artists with additional earnings data to help them be more effective sellers. Today we took a big step in that direction by updating the technology behind your earnings page. Be on the lookout for the next update, which will include some additional data on your sales! In the meantime, check out our Artist Bootcamp series to brush up on creating and marketing your artwork on S6. Access it here, or from the Seller Education link in the left hand column of the earnings page. Quick Tagging is now available! Add and edit tags directly from your artwork management page. Read more about it on our blog and happy tagging! To help streamline the upload process, some of the requirements for moving through the uploader steps have been moved. We now ask that artist confirm that they own the rights to their uploaded work prior to reaching “Step2 – enter info” of the uploader. Please let us know if you encounter any issues! There was a bug that was introduced last week related to updating “about me” sections in member and artist profiles. This has been fixed! We are now enforcing a 20 character maximum on individual tags within the Artist Studio. Additional loading animations have been added to images within the artist studio. We fixed an issue that prevented changes to your display name from updating on listing pages. Comforters and Duvets are now available in Twin and Twin XL sizes! No changes are needed in the Artist Studio to enable these products. In the past, you may have seen some differences between the images that showed up in your collections and what appeared in the Artist Studio and product detail pages. As of today, preview images in Collections should accurately reflect the edits you’ve made in the Artist Studio. Please reach out if you experience otherwise! We are happy to announce that we’ve done some much needed work to improve Artist Shop homepages! These changes will affect the grid of 9 tiles on your profiles and addresses the following issues. Along with fixing the bugs mentioned above, this also sets the groundwork for future improvements to the Artist Shop. We have some big plans so stay tuned for more! We’ve updated the “Apply this image to similar products” dropdown menu from within the Artist Studio to include a few more products, including a way to apply your image from Art Prints, Framed Art Prints, and Canvas Prints to each other. As a reminder, the following products groups can use the same asset. Our search is getting smarter! In addition to making results more relevant and improving artist search, we’ve added features that make filtering for products much easier for customers. Read more about it on our blog and try it for yourself! In the coming weeks and months our very own content producer Ben Renschen will be sharing some very insightful information on how to maximize your success on S6. From how to set up your S6 shop to marketing your products on social media we have you covered! Check out the first post on Preparing Your Art Files for Printing on Society6 Products and stay up-to-date with our Artist Bootcamp series from the S6 blog! We are excited to announce the launch of our new and improved blog! Check it out here to keep up to date with artist features, home decor how to’s, art news, videos, seller education articles and a lot more! Window curtains are now available for sale! As usual, we encourage your to add or edit artwork for this product from within the Artist Studio. Read more about them in our blog, or see them live in action here. We’ve also expanded our cases line by launching Galaxy S8 cases. Check them out here! If you’ve enabled products in the last few days and haven’t seen them show up in your shop, we sincerely apologize. The problem should now be fixed, but if your products still aren’t visible, please let us know! There is a now a 150mb max on files you can upload to the Artist Studio. Rest assured as long as your artwork meets the minimum pixel dimensions for a product and is at least 72ppi, the print quality of your products will not be affected. The tag limit for posts has been increased from 10 to 20! We are happy to announce a couple of enhancements to the artwork management page! To help you find your posts more easily we’ve added a search bar to the top right of the page that will allow you find your posts by title or tag. Additionally, a couple of buttons have been added to the “View enabled products” menu that shows up for your published work. By clicking on the “eye” icon you can quickly view your product and by clicking on the “pencil” icon you will be able to jump into the artist studio to edit the product. Pillow Shams are now available for sale! We’ve done our best to apply horizontal, patterned artwork from your tapestries to this product. As usual, we encourage your to add or edit artwork for this product from within the Artist Studio. We’ve heard that adding and editing tags for your artwork can be a little cumbersome, so we have some changes in the pipeline that should hopefully help streamline the process. For now, we’ve made an update to Step2 (the tagging step) of the uploader. What you’ll notice is that Medium and Style dropdowns have been replaced with a “Suggested Tag” cloud. The tag cloud will continue to provide some guidance on how to tag your artwork, but also make the tag structure a bit less rigid than before. Tagging your artwork is more important than ever. We’re hard at work improving the search and browse experience to make it easier for customers to find your products, so make sure to add relevant tags to your work! Floor pillows will soon be available for sale! If your posts already have Throw Pillows enabled, we have automatically applied your artwork and enabled Floor Pillows as well. To make sure your products are ready to go and get a sneak peak of the product, jump into the Artist Studio and make your edits asap! We’re excited to unveil a new version of the artwork management page! These changes will make it easier for you to stay organized and browse through your list of posts. A new compact layout of the page. The ability to sort your posts by “Name”, “Date published, or “Last updated”. An updated design for navigating between pages of your posts.